We're opening for the season May 2nd! We will be open Wednesdays - Sundays through Memorial Day, then 7 days a week. With outdoor waterfront dining and New England American Cuisine, The Back Porch Restaurant is everyone’s favorite summer dining destination. 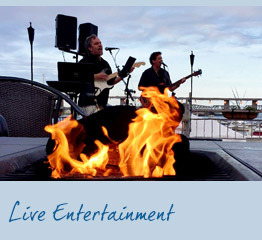 Join us for weekly specials, Happy Hour (Monday through Friday) and live entertainment Wednesdays through Sundays. Conveniently located in Old Saybrook overlooking the Connecticut River. We look forward to seeing you soon! Stay up to date with all of the Back Porch Buzz by joining our mailing list and becoming a fan on Facebook. Also, follow the latest news on our blog! Join us every day of the week for a different special. 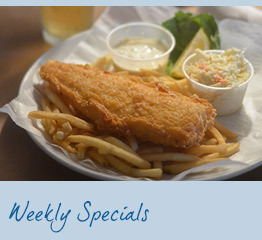 Click here to see the current specials. We are proud to have some of the best bands from New England perform. Click here to view the schedule. 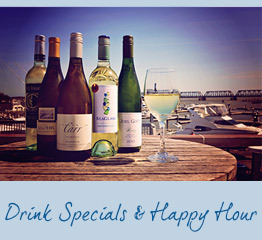 $3 off select apps and $2 off beer, wine and cocktails. Monday - Friday from 4:00 - 6:00pm.